Before we get into this week’s announcements we’d like to take a moment to send our love and support to all of those in Texas and Louisiana being affected by Hurricane Harvey. This city knows all too well what a storm can do to a community, and we stand side by side with those who once helped us when we needed it. To aid in the recovery process, we are opening in our lobby a drop off station for supplies to be sent to Houston. Now let’s get to our new releases. TULIP FEVER is an adaptation of the best-selling novel by Deborah Moggach and has been a production with some serious Hollywood history behind it. With a cast featuring Christoph Waltz and Dame Judi Dench we think the star power alone is enough to give this period piece a look. INGRID GOES WEST and LOGAN LUCKY stay in the lineup next week and continue to be audience favorites while PATTI CAKE$ opens to some serious buzz. We’ve got three very eclectic documentaries playing on the 8th that we think you should check out. HARE KRISHNA, WALK WITH ME, and TURN IT AROUND are all focused on religion (yes, Punk is a religion, and if you don’t believe us listen to some Bad Religion on your next drive to work) and are sure to speak to you in many wondrous ways. Weekend tickets for those films are available online. Next Tuesday, September 5th, we invite you back to $2 Tuesdays with HAROLD AND MAUDE. Alison, our amazing bar manager, has been asking since our grand opening to play this film and now she has the chance to show all of you one of her all time faves. Tickets for each $2 Tuesday selection will go on sale the Tuesday before, so keep on eye on our website and buy some tickets for your friends. 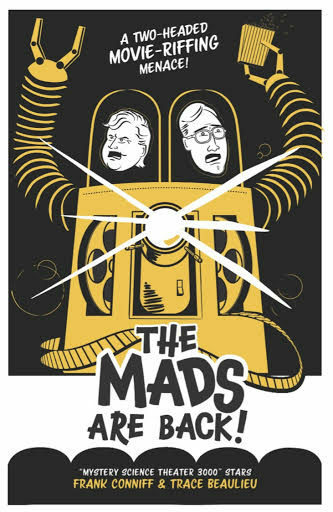 We are happy to report that THE MADS ARE BACK! Come see TV’s Frank (Frank Conniff), and the voice of Crow T. Robot (Trace Beaulieu) from Mystery Science Theater 3000 as they visit us live at The Broad and riff on two different movies over two nights (9/19 & 9/20). Tickets are on sale now so don’t wait to grab your seats for this very special event. The Broad Theater offers limited parking in our surface lot for cars, and bicycle racks for our friends who like to pedal. Sidewalk parking is available throughout the neighborhood including directly in front of the theater. During weekdays, we offer happy hour specials till 6 p.m. Come enjoy $5 draft wines, draft beers, and well cocktails. You can also enjoy a pint of any beer and a small popcorn for only $10!